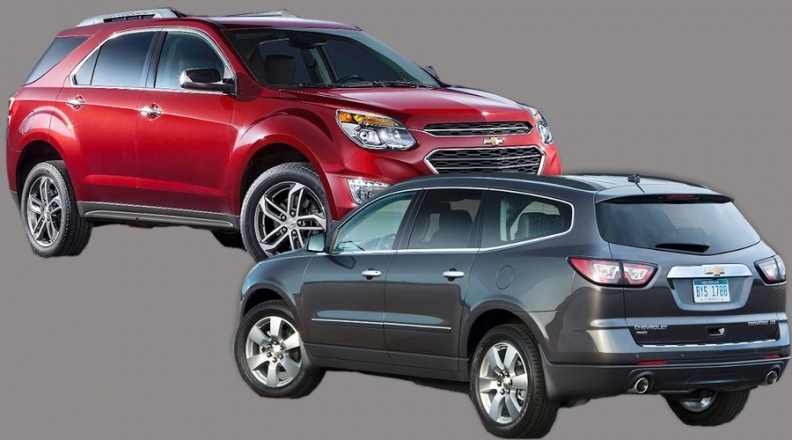 The Chevrolet Equinox (top) will be downsized and a short-wheelbase version of the Chevrolet Traverse, bottom, will be added to the Chevrolet lineup. DETROIT -- General Motors plans to add a new Chevy crossover that will be slotted above the compact Equinox and below the full-size Traverse, according to three people familiar with the plan. The move underscores how mainstream brands are following the lead of luxury marques by finding inventive ways to fit more flavors of crossovers into their showrooms. Chevy's new crossover would give the automaker more flexibility to answer rivals that use a mix of crossovers, plus crossoverlike cars and SUVs, to fill a range of size categories. Equinox: The successor will be smaller. Until recently, most automakers stacked their crossover offerings according to a Starbucks-like menu: tall, grande and venti. But Chevrolet and, increasingly, other brands see opportunities to spread those offerings among four size categories to slake consumers' growing thirst for crossovers. Many of the latest entries are showing up at the small end, such as the Honda HR-V, Jeep Renegade and Mazda CX-3. GM was among the first big automakers to go small in the U.S., adding the Buick Encore in 2013 and the Chevy Trax in December 2014. The coming Chevy model, on the other hand, will be inserted in the middle of the lineup, as a grande plus. And it will require GM to make some adjustments. Step one will be to downsize the popular Equinox. It will shrink a bit when the next generation appears in early 2017, shifting to the same global compact platform that will underpin the redesigned Chevy Cruze and Opel Astra cars, due out early next year. That creates more room for the new three-row crossover to slide in between the Equinox and the Traverse, which also is scheduled for a redesign, in mid-2017. The new vehicle will be a short-wheelbase version of the Traverse, the sources said. The Chevy Traverse, shown, is slated for a redesign in 2017 and will stay full size. 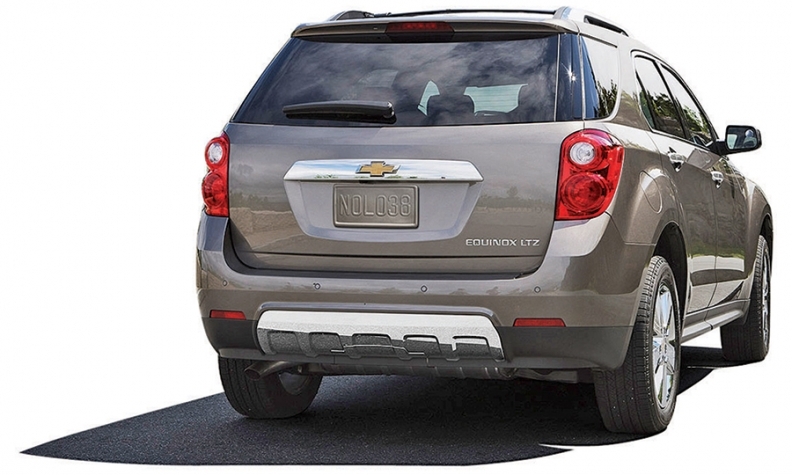 The new midsize Chevy crossover will slot just below it. It's unclear what the three-row vehicle will be named when it goes on sale, tentatively scheduled for the second half of 2017, the sources said. A GM spokesman declined to comment. The new vehicle could give Chevy more flexibility to answer rivals that use a mix of crossovers and SUVs to cover some market territory where Chevy is absent. The Ford Edge and Nissan Murano are slightly larger and more upscale than the Equinox, for example. The Honda Pilot, Toyota Highlander and Nissan Pathfinder offer three rows of seating, but in a smaller footprint and with better fuel economy than the Traverse. With the new entry, Chevy would have three crossovers that roughly line up sizewise against the potent Escape-Edge-Explorer trio from Ford. The strategy extends beyond Chevrolet, though. The shorter wheelbase also will underpin the successor to the Cadillac SRX, called XT5, when it arrives by next spring. And it will serve as the bones for the next-gen GMC Acadia, which will shrink to a three-row midsize when it is launched in mid-2016, the sources said. The Traverse and Buick Enclave will remain full size. It's unclear whether GMC will continue to offer a large crossover based on that same platform after the Acadia scales down. Cadillac won't use that platform for a full-size crossover that it's working on, two of the sources said. Downsizing the Equinox and slotting a three-row crossover above it would be "a smart play," says Jack Nerad, executive market analyst at Kelley Blue Book. He said it would give Chevy two flavors each of two- and three-seat crossovers that all line up well with rival crossovers. "It helps for consumers to be able to compare vehicles," Nerad said, adding: "This crossover trend definitely has legs."